This Up Floor Apartment, First Ocean Line situated, with Ocean View, has 2 bedroom(s), 1 bathroom(s), a useable area of 70 m². 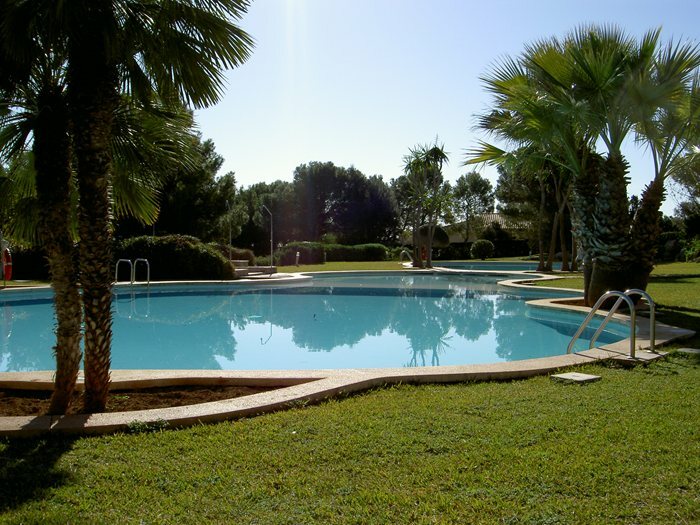 The apartment is situated in „Jardin del Rey“, the „Kingsgarden“, a beautiful cultivated housing estate. The houses are in the opulently planted garden with two big pools and is situated in the first row of houses overlooking the sea. It is located 1,2 km far from the centre of Porto Colom. A walking distance of only 3 minutes brings you to a small cove, „Cala Marcal“ which has a sandy beach. Nearby to the individual apartment resort „Jardin del Rey“ you can find different shopping possibilities like a big supermarket, a drugstore, a bank and a bakery. Here you can enjoy the local cuisine in various restaurants, taverns or cafeterias. The luxurious furnished apartment is situated in the second floor and has a spacious area of 70 m². It is divided into a big living/dining room, two bedrooms, a bathroom and a kitchen with a storeroom. For your comfort you can use the air-conditioning, the heating and the open fire place. From the partly covered terrace, you can enjoy a fantastic view of the sea. SAT-TV and a washing-machine are also available.